When your social media consultant ascertain your goals and make your campaign reach out to the largest audience possible, it might be much more efficient if you know the right number of posts on social media accounts for your business. This post covers the previous research and suggestions concerning a few of the popular social media networks where you might do your social media marketing. The number of posts required per day depends directly upon the life span of the posts on any given site. Research data by SocialBakers highlights this inverse relationship. Lifespan of tweets on Twitter is incredibly shorter than other sites like Facebook where interactions with the post actually increases the visibility of a tweet. A tweet on the other hand lives for few minutes to a maximum of two hours. You can arrive at optimum number of tweets for successful marketing only through experimenting with your own audience obviously. However, an interesting insight can be arrived at by looking at the data provided by Track Social which suggests that the sweet spot might be a little higher at around 5 tweets a day. But the same study also suggests that the overall engagement rate doesn’t really go down even while tweeting as high as 30-50 tweets a day, though it doesn’t match the per tweet average that peaks around 5 a day. Retweets too peak at around 5 tweets a day according to the data released by the Track Social study. For example, tweeting 2-5 times a day has shown that retweets actually go up by roughly 300% compared to tweeting once a day. LinkedIn in one of their own guide for small businesses shares some of the data and insight that could guide you about how to go about figuring out the frequency of posts on LinkedIn. LinkedIn being a network of professionals largely sees peak hours in the weekdays and this has been a well-established fact across various studies. The company’s own best practice suggests that a post a day is the optimal number, and posting on weekends are rather useless. Research data collected by SocialBakers suggests that the average number of posts per day by businesses hovers around 1 per day. The best practice is to post 1-2 posts on weekdays and not more than 1 on weekdays. Posting above 3 posts a day actually has shown disengagement from the audience which causes some followers to unlike the page altogether. Daniel Sharkov in one of his blog posts shares his findings about strategy concerning Google+. He suggests that, at an overall level the more the posts on Google+ the better. Not enough data exists about digital marketing research concerning Google+. Most businesses seem to have stuck between 1-4 posts per day. The jury is still out, and experimenting with first hand data should not be a bad choice as such. Instagram posts actually live much longer than what intuition might suggest. Unlike Twitter, 90% of Instagram posts start getting the first few comments and likes in the first 10 hours of posting. Sometimes posts can live for weeks. These findings by Union Metrics are indeed terribly surprising and insightful hence. Their report suggests that most businesses average around 1.5 posts a day. But some businesses also post as high as 10 posts a day sometimes. The idea obviously is to first develop a larger follower base before increasing the number of posts. After all, quality over holds over quantity. It is generally suggested to make 4-10 posts on Pinterest in a day. Pinterest moves much faster than other social media services. Hence, it’s always wise to post as much as one can evenly spread out through the day, and at the same time using posting some vertical pictures, as they cover more screen space than the horizontal ones. If Hubspot’s research data is anything to go by, increasing the frequency of blogs has no downside in sight. The more the merrier. This obviously comes with more investment in human resources. But is there a sweet-spot which provides the best proportion of leads vis a vis blogging frequency? The number can only be arrived through a consideration of the resources at hand. 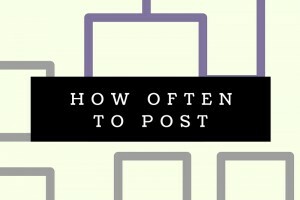 The sweet-spot lies somewhere between 3-5 posts per month to 6-8 posts per month. The data clearly suggests a 100% increase in leads when the frequency of posts was increased to 6-8 posts per month. While using your favorite social media management tools, the above figures and data might be something you should consider before setting the number of posts on different social media services. At the same time have an open mind and know that every small business and every audience is unique. The existing research helps minimize risk and maximize potential during the early days.